A terrific gift for any occasion. You select the value and the delivery method (via mail or email.) Each gift certificate is good for merchandise, coaching, workshops, other and opportunities to work with Laura. This may be the most important book written about storytelling and its benefits in the world today. 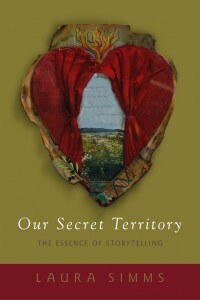 Our Secret Territory explores the power of storytelling and how it can serve as a tool for compassionate service. The book contains tales from around the world, reflections on the symbolic journeys they express, and stories about Laura’s work with people in need in many countries. A collection of 18 stories to learn and tell to children to help them in a time of crisis. Available for Kindle at https://www.amazon.ca/dp/B00GGZL372 . 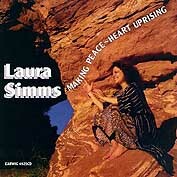 Acclaimed storyteller Laura Simms gives us a rich tapestry of tales that unveil the secrets of love in all of its forms. Passionate, riveting, often humorous, these stories of emotional, physical, and spiritual love come from a variety of traditions, including Celtic, Inuit, Persian, Hindu, and Jewish. As meaningful today as when they were first told, her evocative retellings of these tales of the mysteries of the heart lead us to the many faces and profound requirements of love. These tales from native cultures around the world share the theme of women, woman-spirit and animals. 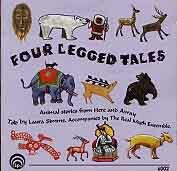 Professional storyteller Laura Simms has a splendid voice; she truly tells, rather than narrates, each piece. The nuances of each unusual story are enlivened with her spellbinding telling. The accompanying music, played on 19 different instruments, is evocative and haunting. The uniqueness of the instruments, from the bamboo flute and didgeridoo to the Irish bodran to the caxixi, are of cultural interest in themselves. Afghan tales in both Dari and English. 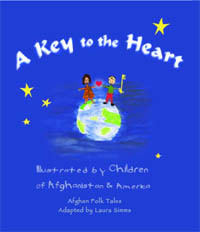 A 66-page full color book illustrated by schoolchildren in NYC and in Afghanistan created as a partnership between Laura and Chocolate Sauce to benefit the education of Afghani children. 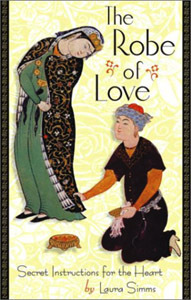 The book is also sold at the Rubin Museum of Art. Read about the project here. With the stories on this remastered award-winning tape, the listener will be introduced to characters who use their inner strengths to conquer the obstacles set before them. Included in this collection are stories like “Moon and Otter,” a love story reminiscent of Cinderella that shows the ability of love and kindness to transform ugliness, and “The Flower of Life” a story about a king, his sons, and the power of love to overcome violence and cruelty. 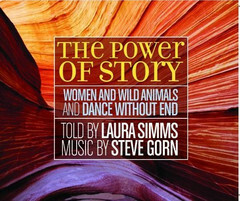 Each of the stories includes a powerful message made memorable by Laura’s entertaining storytelling. Told simply, all of the stories on this tape can be easily understood by children, but contain a depth of meaning that will delight every listener. Ages 6 & up. The stories on Making Peace – Heart Uprising are about transforming aggression into compassion. They can be listened to as a continuous story within a story or as single pieces. The hidden, unspoken story is the experience of oneness, and the magic inherent in both myth and our everyday events. The stories are come from the ancients, but are just as often mixed with tales from the streets of New York. Guest musician include percussionist Randy Crafton, world flautist Steve Gorn, West African griot Abdul Rahman Mangara, singer Deborah Mirabel Rothrock, and Julia Haines on harp and vocals. Earwig Music. STORIES INCLUDE: Rabbit and Lion (Zimbabwe); Dog and Elephant (India/Persia); Two Bears (NW Coast Indian); Monkey, Partridge and Elephant (India), and other tales from the Inuit people, Blackfoot Indian, Byclorusse, Nepal, Osage Indian, West Africa, and Jataka. Ensemble members include Jorge Alfano Randy Crafton Amy Platt also appearing:Steve Gorn, Brad Dutz, Michelle Kinney, and Ishmael Beah. 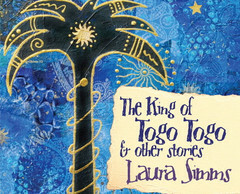 i love you Laura Simms, my friend, my teacher, king of togo is one of the most loved stories in my life! 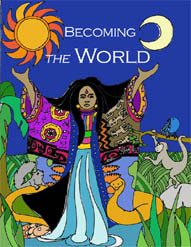 Hi Laura I’d really like to buy the Becoming the world as a PDF but can’t see a button that allows that. Also do you think you will be making your CD’s and audio tapes into MP3’s to download anytime soon. As I would love to buy them. I have only just come across you and I’m in complete awe, you are brilliant!! Thank you for your wonderful work. Your stories bring me to tears for their beauty, creativity, and truth. I love them all. Especially the King of Togo Togo and Fern Girl, among all the others as well. How exciting to have this all available on CD. My son asked me what I believed in, and I responded, each piece of grass whispered to the other .. . . everything is alive, everything speaks. . .” (He has heard the story many times.) He told me the tale of Mycelium Running,- the book that tells of mushrooms communicating and agreed with me. True and total magic. Thank you so much for making my life (and that of my students and children) and the world so much richer. 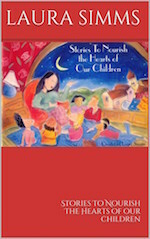 Laura, your book “Stories to Nourish the Hearts of Our Children” is a wonderful read, and has been a great help with a couple of children I have worked with. Thankyou!